Earlier this week the moon was so bright that I remarked to the editor that these were “Ned Kelly” nights. Ned Kelly, of course, was the notorious bush ranger who has achieved status as a cultural icon in Australia. Ned was eventually hanged by the authorities in 1880 at the young age of 25. Despite his lawless ways, Ned at the time (and also since then) had a great deal of public support as it was generally understood that he and his family faced very real difficulties as both people of Irish descent and land selectors (small land owners) at the hands of the authorities who generally favoured the wealthy and much larger land owners (squatters). And nights where the moon showed exceptional brightness were ripe for Ned and his band of bush ranger’s to traverse the countryside exacting revenge for the many real and supposed wrongs done to him and his family. The moon really was that bright earlier this week and the forest was full of moon shadows. Outside of the well-lit Melbourne Central Business District, Australians generally don’t enjoy walking at night. 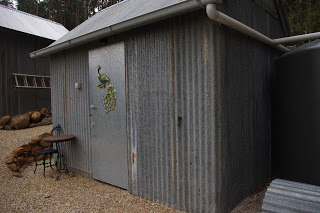 Way back in the day before our rural adventures commenced, the editor and I lived in an inner suburb of Melbourne which was a mere four kilometres (2.5 miles) north of that city. It was a great area to live in as there was so much to see in and around that area. The old gas works site dating back from the days before the supply of electricity had been converted into a park. One of the local pubs was even named The Gasometer and I wonder now how many people would even realise the origins of that name? At one stage an old steam locomotive sat alone and forlorn in the park. It sat on a very short section of what remained of the now disused and dismantled railway. There was even an old fenced off timber railway footbridge perched high in the air and missing many treads. Both were removed possibly because of public safety (i.e. liability) concerns and who knows what their eventual fate was? As an interesting side note, the site adjacent to the old gas works had always been set aside as a large park. In the late 19th century, the gardeners of that park laid walking paths and planted elms which have since grown into huge mature trees providing valuable shade over the long hot summers. At night those trees also provide habitat to the many marsupial possums that call the park home. The possums are only ever active at night and that is when a person can see and hear their activities whilst the possums get up to whatever mischief possums do. If you’ve ever had the pleasure of hearing a full-on possum fight, then you will know that the sounds that they make are truly blood curdling. And should the possum population ever be so unfortunate as to build up to unsustainable levels, then a canny Powerful Owl will leave the forests surrounding the city and take a short trip into those city parks and totally decimate the possum population before moving on again. At night, I’ve seen and heard those Powerful Owls at work in the city parks and all I can say is that they are a force to be reckoned with and possums (and possibly small Scritchy bosses) are nervous. The housing in that surrounding area was constructed in the 19th century to provide homes along the many tram lines and railways for the people that worked in the old gas works and other heavy industry surrounding that area (the granite quarry and shot tower are both still visible today). Walking around at night, the editor and I used to enjoy the eclectic range of old houses. Many of the larger and grander houses surrounding the park were clearly built to house the owners and managers of the gas works. And as you walked the streets further away from the park, there were smaller houses which had been constructed to house the families of the people who worked in that area. All of this could be seen by simply walking around and looking and observing. Nowadays, the editor and I still walk at night. However, instead of observing the hand of man, we see nature. Most of the animals in this corner of the planet are active at night. This may be a result of many thousands of years of selection by the Aboriginals or possibly because it is cooler at night during summer. Whatever the reason may be, night-time is the time to spot the many animals that live here on the farm. On our walks, the marsupial bats fly around chasing insects whilst making a “zip, zip, zip” sound. Sugar gliders are impossible to spot but you can definitely hear them making “clicking” sounds high up in the tall trees. Possums in fight mode are simply blood curdling (just like their city cousins). Kangaroos usually quietly munch the grass but occasionally grunt loudly as they fight their rivals for a choice bit of green pick. Wallabies rip and tear chunks off our fruit trees. And the roar of an enraged – and possibly quite drunk on toxic leaves – bull Koala bear is awesome. 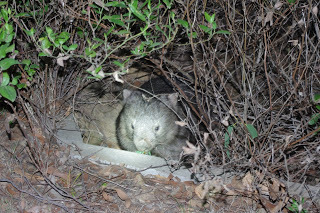 This week however, one of the wombats that live here has decided to regularly play a trick on the editor and I. This particular wombat hides in a clump of foliage and as we approach closely, without warning she suddenly growls and hisses and furiously shakes the foliage that she is hiding in. And then… Nothing. The wombat – after raising my blood pressure several notches – simply gives me this look which says: “You may admire me now”. Certainly, she is a good looking wombat, but then other wombats at the farm – as well as most of the other animals – enjoy access to plenty of regular quality food and water all year round. They do cause a lot of damage, but they also convert a lot of that compost fed vegetation into manure, which in turn makes this farm more productive. Letting the animals roam freely through the gardens has a cost, but it also brings benefits. In the more fashionable western end of the mountain range there are a number of very well established gardens where the wildlife is often excluded by fencing. The difficult thing for those animals is that whilst they live in the forest surrounding those gardens, there is very little for them to eat within the forest itself. Traditionally the animals consume vegetation from the many clearings within the forest. Over in that part of the mountain range I have heard of reports that the local marsupials have the skin condition “mange”, which removes the fur in patches leaving irritated skin. The mange can get so bad that the animal does not recover and eventually die. Despite being only a small distance away, I have never seen any signs of mange on the well fed animals that live here. 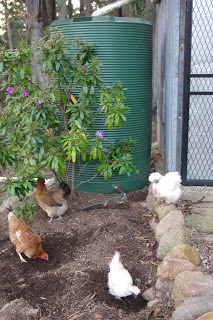 Even the small birds (wrens and honey eaters) that live here enjoy full access to the compost fed gardens and they consume most insect pests that are silly enough to attempt to try and eat the various plants. I’m shamed to admit it but even Poopy’s fur is benefiting from the insect consuming act. Poopy with the good hair? 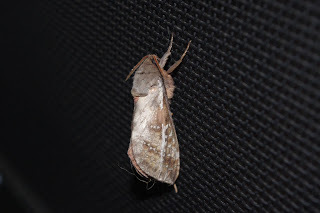 At this time of year, the very large (and edible) Bogong moths turn up whenever I leave a light on outside the house. Unfortunately, Poopy has acquired a taste for the Bogong moths and consumes them wherever he finds them. Mind you, Poopy does have a very nice coat of fur as can be seen in the next photo. Recently, a new bird has begun to call this property home. Like Poopy it is also enjoying the regular feed of Bogong moths and other insects drawn to the lights. That bird is an Australian Owlet-nightjar and I only noticed its presence because whilst walking outside at night I noticed that the outside lights were intermittently dimming. I always try to investigate odd incidences and it was then that we noticed the bird swooping in front of the lights to catch the unsuspecting moths and before landing in a nearby tree waiting for the next unsuspecting snack. 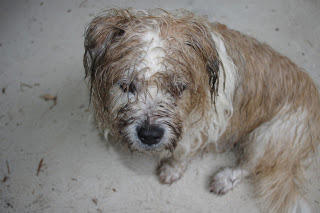 It rained quite heavily over the past few days and unlike Poopy who is sensible enough to avoid getting wet, Sir Scruffy has other ideas, and after a brief voluntary walk in the rain, he looked like a drowned rat. He most certainly doesn’t have good hair for such experiences! The days leading up to the heavy rain were unexpectedly quite warm for this time of year and one morning the clouds put on an exceptional display. Maybe they were imitating the famous trademarked ribbon device? 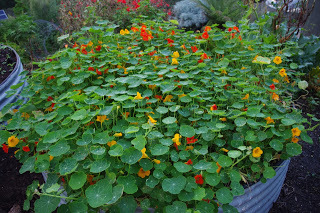 Also the Nasturtiums are providing plenty of food for us, the honeyeater birds and the European honey bees this week. 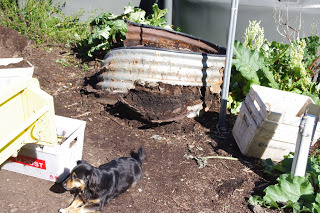 This week, two of three very rusty steel raised vegetable beds were destroyed as the steel had almost collapsed and was paper thin. It was a surprisingly quick job to cut them up and redistribute the excellent soil. Observant readers will be able to spot Toothy with the good hair in the photo below! Toothy may also secretly be consuming Bogong moths. 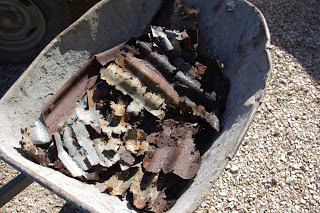 There was surprisingly little steel left over from that rusty raised garden bed. All of the raised garden beds were pruned and weeded this week in preparation for the winter vegetable seeds which have now been sown. It is looking quite neat and the asparagus has grown massively this year too. 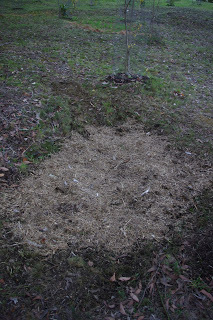 Prunings are valuable compostable material and some of those prunings were dumped into a hole in the orchard. 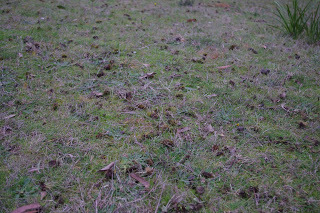 I then ran over the prunings with a motor mower in order to increase the surface area of all of that material. Increased surface area will ensure that the material breaks down into soil more quickly than it otherwise would. Over that mess, I added some compost and then bedding material from the chicken enclosure which is full of chicken manure and seeds. That process is an effective form of composting and requires very little further effort on my part. After a few weeks it will look like the photo below which is from an earlier pile. The rain was an opportunity to do some indoors activities. After another half a day’s work, the new freestanding island bench in the kitchen is almost complete. The manmade stone benchtop has been ordered and will arrive in a week or two. Also, the construction of the new freestanding steel support for the solar panels has almost been completed this week and in another day or so it should be fully painted. The temperature outside now at about 8.15pm is 9.5’C (49.1’F). So far this year there has been 190.2mm (7.5 inches) which is up from last week’s total of 156.8mm (6.2 inches). I only began to worry when the guy in the van that I was instructed to follow flagged me down and asked me to pull over and park. The story he told me was that he’d forgotten to bring the keys for the companies second factory and so he had to return to the original factory. 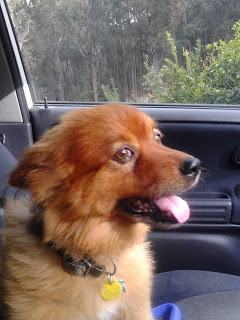 I was instructed to patiently wait in my car on the side of a very busy road until he returned. It was at that point that the realisation kicked in that he had all of my paperwork and I’d already paid him in full. I simply had to wait patiently whilst pondering the potential error of my trusting ways. Regular readers will recall that the kitchen has been expanded recently because we’d completely run out of space to store preserves and the food preparation space was becoming increasingly limited. The situation had become feral! Food was being stored all over the house, but for some strange reason the office where I work – and the editor swears this was not intentional – had far more than its fair share of preserved food in various states of storage. As an interesting side note, those new kitchen cupboards are now completely full of: ginger wine; bottled apricots; jams; potatoes; onions; olives; chutneys; and passata (tomato purée). 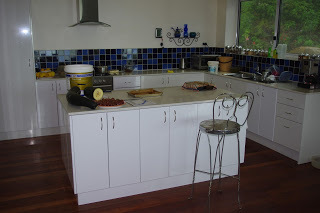 Unfortunately, it had been many years since I had constructed a kitchen and the artificial stone benchtops which I had previously used had become very expensive during that intervening time. Also most of the companies supplying those artificial stone benchtops also wanted to conduct two site visits at my expense. Firstly to perform the measurements and finally to provide delivery and installation services . I didn’t really want to pay for those additional services because I can competently use a tape measure, and for delivery nothing beats the trusty bright yellow trailer, which also happens to be the cheapest option! Financial tightness is celebrated here! 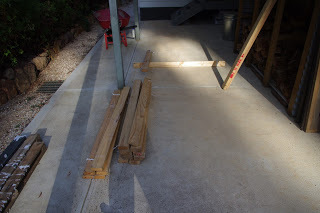 Whilst waiting to source a cheap benchtop for the new cupboards, I simply placed two scrap bits of plywood, which were otherwise lying around outside in the rain, on top of the cupboards. I don’t actually recommend using scrap plywood as a working surface in a kitchen because it is almost impossible to keep clean. After a few enquiries, I finally tracked down a company who was happy to sell me an artificial stone benchtop cut to size which I could pick up directly from their factory. The editor and I took a trip into the big smoke of Melbourne and checked out the business, met the owners, agreed on a price, paid for the benchtop in full, and then simply waited a week for them cut the stone to our specified size. On Friday, I received a phone call from the bench dude letting me know that the stone benchtop had been cut to order and was now ready to pick up. Unfortunately, at that time, the bright yellow trailer was full of manure for the garden. Maybe it is just me, but I’m guessing that manure and a clean artificial stone benchtop is a bad mix. The manure was rapidly moved out of the bright yellow trailer and placed in a new raised garden bed. Observant readers will be able to see in the excavated area, a thin black line which is the layer of top soil (no more than an inch / 25mm) which has naturally formed over the past decade. 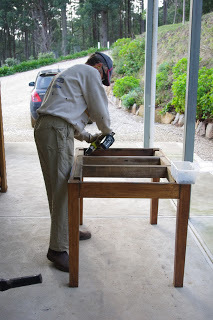 Now that the bright yellow trailer had been cleared of manure, I recalled that the bench dude had issued firm instructions for us to transport the benchtop in an almost vertical position (glass is also transported in this manner so as to avoid breakage). 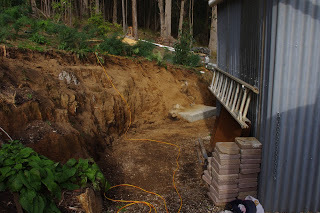 The editor and I had decided to construct a timber frame which would be used to transport the artificial stone benchtop. Unfortunately, we didn’t have nearly enough scrap timber on hand to build the timber frame. So, off to the local tip shop we went! We had to hurry because the day was wearing on and the tip shop closes at 3pm sharp. The local tip shop in all its glory. Good stuff! 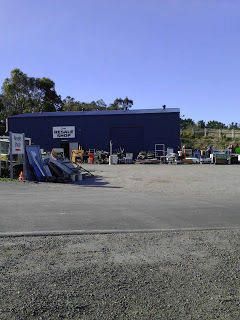 The local tip shop is full of building materials and other interesting stuff. 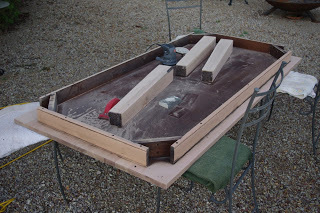 I took down an old table saw which was in working order, but which I had not used for many years and would be happy if someone else could make better use of it. In turn I found an old bed base which had more than enough timber for the timber frame. A reasonable price was agreed upon, there were smiles all around, and we were on our way home again. 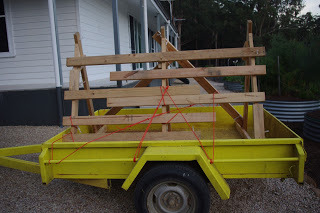 After another hour or so of construction, the timber frame had been completed and was tied onto the bright yellow trailer. The next day I met up with the bench dude at the factory as agreed. The benchtop was located in another factory where the cutting took place. And this is where todays story began. Fortunately, the guy soon returned as he really had forgotten to bring the keys for access to the second factory! The entire episode smelled of a scam to me, but no, it was a genuine mistake. This was a relief for me, because not only would I have had to pay another person for yet another benchtop, but extracting retribution for falling for the scam by throwing a brick through their plate glass window late one night would be counter to my ethos. I like to do projects as cheaply as possible, and bricks are expensive you know! Once the benchtop was loaded into the bright yellow trailer, then began the unpleasant return journey. 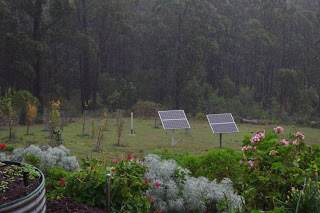 That day was very windy and the benchtop, which was placed in a near vertical position, was like a giant sail. Eventually, I arrived back home safely with the benchtop. As an interesting side note, when a person buys a stone benchtop cut to a specific size, the original item is much longer and you pay for the full length regardless. 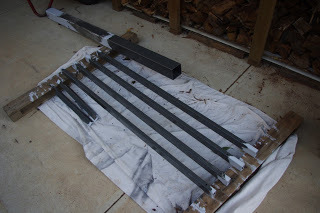 In my case the original length was 3,200mm (just under 10ft) long, but my benchtop was cut to 1,850mm (72.8 inches). This also provided me with a second smaller benchtop of 1,350mm (53 inches) which will be used in a future project. Canny readers may quickly realise that there are a lot of smaller stone benchtop off cuts being sold (or disposed of) about the place for not much money at all! Poopy and Sir Scruffy admire the panache with which the benchtops were brought back to the farm – on the cheap! That benchtop was heavy. It weighed in excess of 100kg (220 pounds) and it was a credit to the editor and I that we carried the benchtop up the stairs and through the house. I have to “fess up” because I almost dropped it once when the weight shifted unexpectedly as I was walking backwards up the stairs! Anyway, the benchtop was soon fixed into place and the kitchen upgrade was complete. 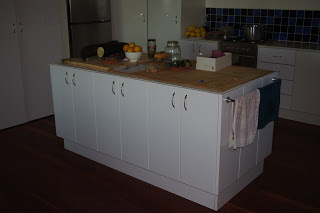 The editor was happy that the new bench and cupboards matched the original finishes, although I have to admit to being rather fond of the plywood benchtop look, despite its many practical downsides! And best of all we completed that project at a relatively low cost. With the kitchen upgrade now complete, we continued preserving foodstuffs for use later in the year. 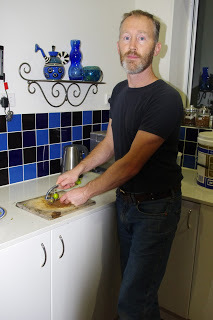 This week the olives were pitted using a very old stainless steel hand operated olive pitter / garlic press. This older unit is far stronger and more effective than a recently obtained olive pitter which may be recycled. We preserve olives by keeping them in fresh water for four days (completely replacing the water every day). At the end of that period, the olives are then placed in salt water for four weeks (completely replacing the salt water once every week). You can tell if not enough salt has been added to the salt water because some of the olives will float. You can also tell if too much salt has been added because the olives will eventually taste very salty. 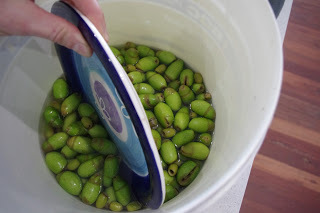 I use a plate in a bucket to weigh the olives down so that they do not come into contact with the air – which may cause the olives to mould. Observant readers will also note in the photo below that this variety of olive changes colour during the preserving process from bright green to a drab olive green and you can see that happening with these olives. Over the next few weeks, depending on the weather which can be challenging for outside work at this time of year, I will hopefully install a few extra solar photovoltaic panels. However, before I could even consider adding a few extra solar panels to the power system, I had to replace most of the circuit breakers in the battery room. A circuit breaker is a device that automatically cuts the power if something goes wrong. As the system had expanded over the years, the original circuit breakers had less margin for error. 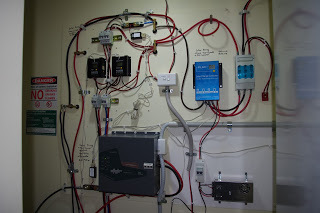 Because of the real risk of fire if a problem develops in an off grid solar photovoltaic power system, I decided to err on the side of caution and replace all of the circuit breakers. Whilst I was replacing all of the circuit breakers, I also decided to completely rewire all of the major components in the battery room so as to neaten up all of the wiring. The solar power system had been developed over a number of years and so a complete rewire of the battery room for neatness was probably due. I did underestimate the amount of time that it would take to complete that project which ended up being about ten hours over two late nights. With these sorts of occasional projects, it can be very hard to know how long it will take to complete. The results look good, although they may be incomprehensible to most people! For the past two days it has rained. I’m very happy to see that wet stuff falling from the sky. So much rain has fallen, that the very large and empty 33,500 litre (8,850 gallons) water tank has even begun the long process of refilling. The swale which collects any and all water runoff has filled this week. A swale is the fancy name for a ditch which collects water and allows that water to infiltrate into the soil. The two willow trees in the swale were very happy to receive a good drink. In preparation for the new solar panels I also cemented the steel post into the ground and unfortunately, it rained before I could complete painting the dark grey top coat. I thought that it may be useful for readers to see how I can quickly tell whether any post is exactly vertical. 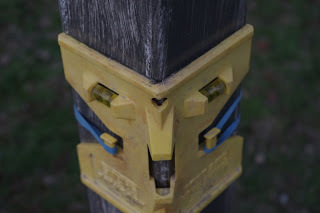 For about two decades now, I have used a yellow plastic post and pipe level. It is a very handy tool as it has two spirit levels both of which indicate whether the post is exactly vertical. 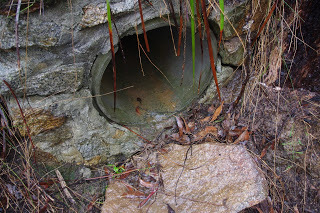 With the heavy rain, the concrete pipe / culvert which directs water onto the newly planted fern gully flowed today! 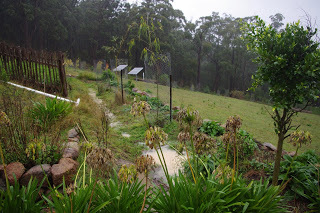 And that flowing water travelled exactly along the line of the recently planted ferns. The temperature outside now at about 5.30pm is 11.5’C (52.7’F). So far this year there has been 210.0mm (8.3 inches) which is up from last week’s total of 190.2mm (7.5 inches). The heat was surprising north of the border. Of course up north it is arid land and you can smell the red dust in the air. That dust got onto (as well as into) everything. This was the place where my friends had decided to celebrate the New Years in style. There were countless hippies in that hot and huge campsite. I was surrounded by a sea of colourful tie-dye shirts, cheesecloth pants, the sound of bongo drums, long hair and unkempt beards. I calmly strolled in wearing jeans, leather boots and a t-shirt. I quickly felt like I was an alien who had just dropped down to Earth for a quiet ale or two at the local pub, but instead ended up in the Manson Family commune. It probably didn’t help that one of the boxes full of camping stuff which I had been laboriously lugging back to the campsite in the heat and dust had the inscription in large lettering: “Australia Post”. It was a very handy and useful box, but the derision that I received because of that particular inscription from the multitude of hippies was almost constant as I made my slow way to the far distant campsite. I heard every comment imaginable from “hey, look there’s the postie” and “have you got any mail for us, mate?” Some of the comments were quite imaginative and not fit to repeat on a family friendly blog. Needless to say by the time I eventually arrived at my friends campsite, I was angry, hot and very grumpy. Maybe I’m just contrary, but the activities held at the campsite like mud-bathing, bongo drumming into the wee hours, fire stick twirling and lessons on peaceful protesting just didn’t appeal to me at all. I’m hardly the sort to consider peaceful protesting anyway. Once long ago, I re-blocked a house which involved a lot of crawling around in mud, so I’d seen enough mud for one lifetime, thanks very much. At least the predominantly vegetarian food sold at the campsite was very good, although I had vague suspicions that one of the suppliers was apparently a cult. I don’t particularly like cults, so that was something else to be unhappy about. I continued to wear my leather boots, jeans and a t-shirt (much like my current look – hey it works, don’t knock it) whilst at the campsite. Everyone else wore their tie dye, cheesecloth tribal gear which clearly said to me: “I’m a hippy because I look just like everyone else”. And I was still the alien circling in and amongst the hippy brethren. Fortunately, the tides of chance turned in my favour. 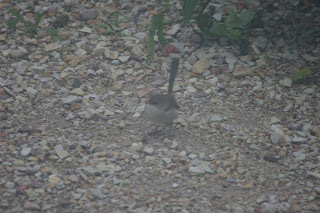 After a few days of the unrelenting heat and dust, it eventually rained. And then it rained some more. Actually, it rained a whole lot that day! And then the huge campsite flooded. I even witnessed a mates tent slowly float away whilst we all stood around and watched on in amazement. My mate had set up his tent in a dry billabong which rapidly filled up with water once it started raining. It really rained a lot and everyone got quite wet. Then a funny thing happened. The hippies disappeared within a few hours. There was no more tie dye or cheesecloth anywhere to be seen. Apparently, tie dye is not colourfast and the dye runs in the rain. And cheesecloth is just see-through when it gets wet and you may as well not be wearing anything at all in those conditions. What replaced the hippies were what looked like normal everyday people to me, wearing normal everyday clothes. And within a space of about 24 hours, the entire huge campsite emptied. Those events were less than two decades ago. Nowadays, I suspect that most of the people from back then that were wearing the tie die and cheesecloth, now live quiet lives in the suburbs with their families. With one notable exception, most of my friends now also choose to live that that life. That quiet, suburban, 1/4 acre, family oriented existence is the mainstream Australian narrative. The Great Australian Dream is a belief that in Australia, home ownership can lead to a better life and is an expression of success and security. This mainstream narrative accommodates people looking differently, as long as they live in the expected manner. Nowadays, the I feel that the hipsters play the role that the hippies once did. A person grows an impressive beard, wears uncomfortably tight pants and puts on certain affectations. To me it looks the same and I wonder whether those same hipsters in twenty years time will look back to their hipster days and recount the once impressive facial hair? I wonder to myself what happens when the mainstream narrative that is being pushed no longer provides as it once did? 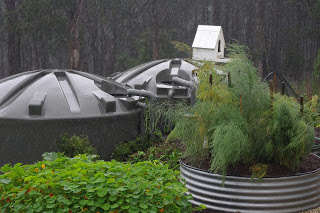 What actually happens to the hippies when it rains? From my perspective the mainstream narrative does not appear to provide for its adherents as well as it once did. The median house price down here is insane with the Melbourne median house price currently at $713,000. I speak with a lot of people and I know that for the young, home ownership is a real difficulty because of the huge costs involved. There are other complimentary costs relating to achieving the mainstream narrative such as expensive weddings, student loans, car leases, consumer goodies etc. I hear similar claims quite often from all corners, and they appear to me to be used to support the mainstream narrative, because alternative narratives are made to look unpalatable. And yet I still wonder what it all means when I see that that narrative is failing to deliver for some members of our society – particularly the young. Long term readers will recall that I am tight with my money and that is related to my contrary anti-mainstream-narrative outlook. And because I am tight with my money, I built the house here myself providing all of the labour other than the plumbing, electrical and original excavations. Often when people learn that I built this house myself, they inevitably ask the unusual question: Is it a mud-brick house? That seems to be a common perception. I haven’t checked, but I don’t believe that this house is built from mud-bricks! No disrespect to the couple that recently purchased that home referenced in the article, but I fail to see how that house is a stone age house. However the article appeared to me to be written in such a way as to make the couples existence look quite unappealing. An unappealing look can only serve to increase the appeal of the mainstream narrative. An alternative doesn’t need to look that way at all. It doesn’t need to leave you with see through clothes when it rains. 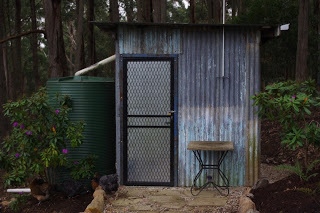 It certainly doesn’t need to involve smelly composting toilets that you need to empty manually. It also doesn’t need to cost the Earth. It doesn’t need to cost a lot to live in either. And that is what this blog is about – someone needs to tell a different story that isn’t one of the all too familiar going back to the caves scary story of fear, but it isn’t the mainstream narrative either. It is time for a different narrative, and one that works. I say people: Celebrate your tightness and keep away from the tie dye and cheesecloth! With that out of the way, let’s get onto more serious stuff. The editor and I moved lots of large rocks this week. The rocks are being used to extend the new garden bed. 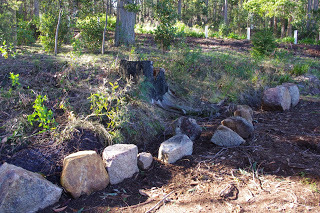 In the middle of that new garden bed was a very old (and burnt from the 1983 bushfires) and also quite large tree stump which I cut down using the chainsaw. All of the bits of dry timber were harvested for firewood. 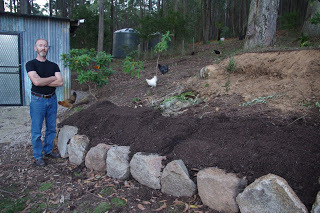 A couple of cubic metres (2.6 cubic yards) of mushroom compost (that is the fancy name for composted horse manure and bedding straw) were added to that new garden bed. 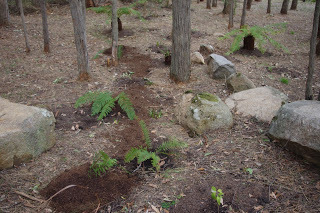 The garden bed was then planted out with many different varieties of ferns as well as musk daisy bushes (Olearia Argophylla). The shrub is a very ancient variety of tall, hardwood and long lived daisy. All of these plants are very common in this area. 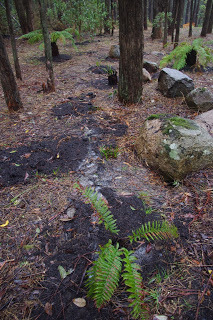 More ferns and mushroom compost were added to the new fern gully which captures water from the road. Observant readers will note that this farm has a lot of ferns, hence the farm name! 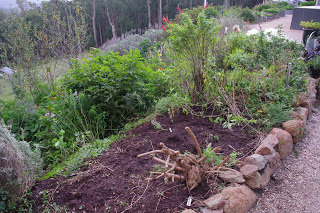 The herb beds received a massive prune this week. Most herbs appreciate being pruned annually (they originally evolved to heavy browsing by animals). In the foreground of the photo there is a strange looking plant which received a very heavy pruning. It is a Roman wormwood. The plant now looks to me like a scary alien from the movie of the same name, and had branches so hard that the pruning required the chainsaw. All of the cuttings from the pruning job were placed underneath the mushroom compost in the new garden bed in the photos above. 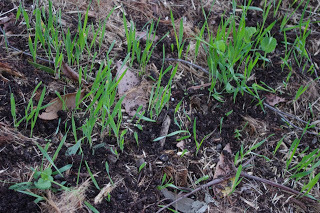 Over time, that plant material will compost into very rich soil. 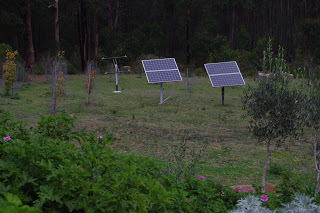 The new free standing solar panel mount has neared completion. It now only requires a top coat of quality metal paint which should happen – if the sun shines for long enough for the paint to cure – over the next week. 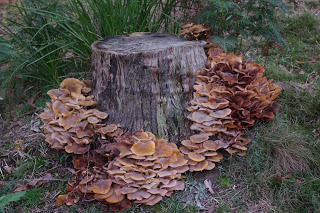 I spotted this amazing collection of fungi which are clearly enjoying breaking apart this old tree stump. The fungi are doing a great job breaking down that plant cellulose into minerals and rich soil. This month, I note that the average maximum temperature for the month of May (which is late autumn) in Melbourne is 20.5’C (68.9’F) whilst the long term average for May is usually 16.7’C (62’F). It is unseasonably warm. I noticed a Rhododendron shrub was beginning to put on a good show of flowers at this unusual autumn time of year. As the season is cooling towards winter, the citrus fruit is beginning to ripen. 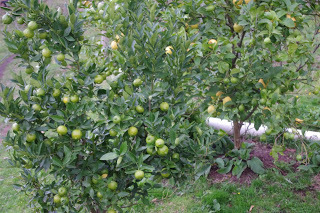 At the moment I’m harvesting: grapefruit; limes; lemons and mandarins. Yum! Many of the fruit trees are still young or recovering from previous years wallaby damage, so I hope that in future years the crops will be even larger. The tomatoes are still giving, even though it is only a mere two weeks from the official start to winter. Readers can also play the game – where’s Toothy In the photo below? I planted a huge selection of cuttings from summer berries including: Jostaberries; gooseberries; and red and black currants. By planting, I mean just shoving the cuttings into the ground to see what happens. 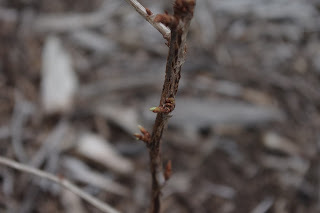 And they all seem to be taking root and producing buds… Perhaps these are the fearsome triffids? Some evenings I sit outside and look up into the sky and see the spiral arm of the Milky Way. Mars shows as a bright red star here, whilst Venus appears to me to be the brightest star of all in the sky. And they move in amongst the myriad other stars in the night sky. All the while the Boobook owls call to each other in the distant depths of the forest, the frogs croak from their hiding places among the vegetables, the sugar gliders dart from one tree to another, and the bats chase the – apparently tasty – moths. And I am struck by the sheer wonder of life on this planet. The temperature outside now at about 8.45pm is 11.3’C (52.3’F). So far this year there has been 262.2mm (10.3 inches) which is up from last week’s total of 210.0mm (8.3 inches). This is the CBF, how may we help you today? I’d like to invest some trees in the Cherokee Bank of Firewood, I replied. Thanks for your enquiry Sir. I can recommend the government guaranteed at call deposit account which earns, let me see here, a rate of return on your deposited trees of 1.5%. Remember that this account is an at-call account and you can retrieve it at any time from one of two firewood branches which are located near you, for your convenience, and it is government guaranteed. Oh, I was hoping to get a better return for my tree investment? I’m sorry Sir, I’m not authorised to speak with you about those more sophisticated investment options. Would you like to speak with one of our specialist tree wealth planners? I’ll just put you through now Sir. Hey, this is Carl, I’m a specialist tree wealth planner, how are you going today? I’m good. I’m looking to invest some trees with the CBF but I was after a better return than the standard at-call account. Sure, I should be able to help you with that. Before we get started, just how many trees are we talking about here? That sure is a lot of trees. Yeah, it is a lot of trees. I’ve been collecting them for a while, but the growth hasn’t been as good as it could be. Yeah, I’ve heard that story. With so many trees, you are clearly a Sophisticated Investor and I could get you into one of our Green Leaves Managed Investment Trusts. It is an exclusive investment opportunity available only for Sophisticated Investors with plenty of trees, and the returns are good. It is a revolutionary product! That sounds great as I love circles. So, I’m interested. Just how good are these returns? Oh, the returns are really good. Here is a testimonial from one of our sophisticated investors enjoying what is known as the returns from the: CBF Green Leaves Derivative Managed Investment Trusts Number 7. I’m starting to get excited at the thought of all of those derivative returns. Yeah, we’re excited too! The really smart money nowadays is into leveraging. And you want to be smart because interest rates are so low nowadays and tree growth is also low so you’re competing against other investors searching for yield. I know that the best way to score those higher yields is to borrow against your initial tree investment and then use those borrowed funds to grow your tree investments. If you earn more trees than you borrow, then you are miles ahead. This sounds great. Where can I sign up? Well, as a Sophisticated Investor with a large tree portfolio to invest, you can have exclusive access to our CBF private wealth specialists who will assist you personally and help you to make the smartest investment decisions! 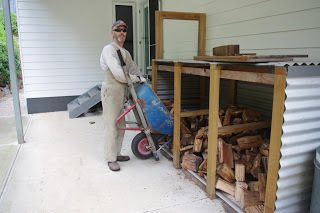 Apologies for the silly banking digression, but this week I began withdrawing a few loads of dry firewood from one of the two branches of the Cherokee Bank of Firewood (CBF) – err, sorry, I meant firewood sheds. Access to dry, seasoned, cut, and split firewood supplies is better than money in the bank. Managing the firewood resources here has been a very long learning process for me that has taken six years of accumulated experience. And it is only this year that I believe that I have stored enough firewood for the entire years supply. Firewood is a useful energy source as it provides heating for: the house; the hot water system; and an oven and stove top for cooking. However, managing firewood that is harvested form the local trees requires a person to consider their energy needs not just for today, but for many years into the future. The local trees, Eucalyptus Obliqua (Messmate) will not burn when they are green (which is a fancy way of saying: Alive). They require two years of seasoning (which is another fancy way of saying: Dead) before they lose the sap and moisture that prevents them from burning when green. 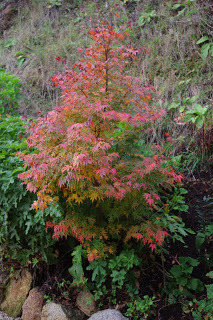 And even if those trees have received the seasoning, if they are at all damp from the very humid winters here, they won’t burn and it is almost impossible for them to dry out during this humid and cold time of year. As you can see, it is a complex problem learning how to manage a local resource. One mental tool that has served me well with answering those management questions is the concept that: If I’m not considering how to manage a resource or system, then it is probably working and requires no further thought. Firewood has been on my mind in previous years, but not so this year. 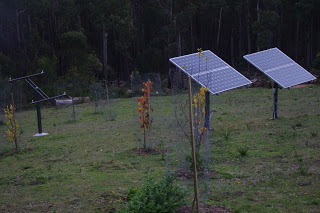 Last year was a very cloudy winter and so I made the recent decision to add two extra solar photo-voltaic panels to the power system. Regular readers will recall that the steel free standing frame was manufactured out of scrap steel and then installed over the past few weeks. This week that free standing frame for the new solar panels received a final coat of quality metal paint. This part of the mountain range has long been associated with agriculture, although you wouldn’t know that nowadays as the forest is very dense. 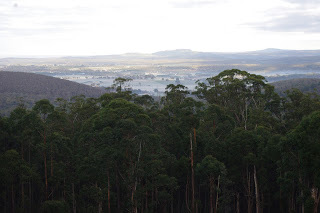 The train line from the goldfields in Bendigo to Melbourne passes this side of the mountain range and historically timber, berries, and potatoes were all harvested from here and transported into Melbourne by steam train. Long time readers will recall that strawberries and potatoes grow like feral triffids here. However, the local wildlife loves berries and last year was the final straw for me as I was able to harvest less than one kilogram (2.2 pounds) of strawberries because the entire crop was eaten – plants and all – by pretty much any animal that could eat them, including my own dogs! 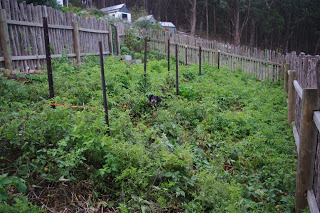 A few months ago, the editor and I abandoned the existing berry growing systems and had a complete rethink and brainstorming session on how to grow these high value crops without feeding all the wildlife (and dogs!) in the process. We then hatched a cunning plan and over the next few months we will commence constructing a series of different enclosures for those crops in an unused location on the farm. 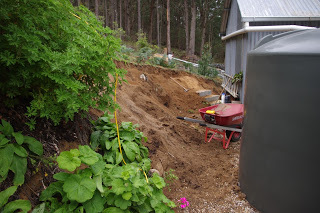 However, before that commences, we have to complete the excavations and new garden beds behind the machinery and firewood sheds that were constructed last year. Those excavations are a big job and they also include the construction of a set of concrete stairs providing access to that new plant growing area. The new berry and potato beds will be planted on a terrace above these two sheds. 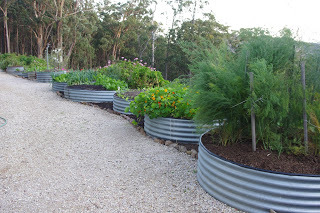 You will notice that the current garden bed is way too steep and so very few plants have ever grown there. The excavations over the next few weeks will correct that problem.The excavations have to be completed so that the new terrace is sited correctly. 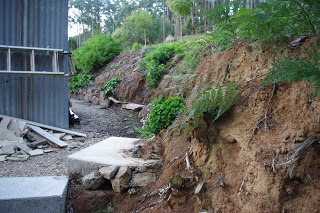 During those excavations a lot of clay fell behind the firewood shed (‘the peacock branch of the CBF’). 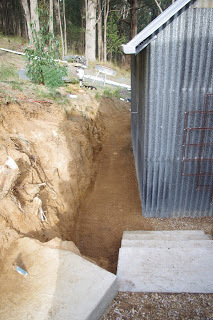 This was a problem because access behind that firewood shed had also not been previously completed. Further excavations had to then be undertaken behind that firewood shed simply to obtain wheelbarrow access to the clay that had fallen there. 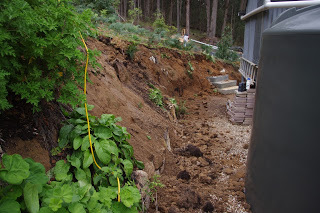 You will also notice that the slope of that cutting is still far too steep and future excavations will have to be completed to make the cutting less steep before that area can be planted out. Observant readers will be able to spot Toothy the overseer in the photo above enjoying a quiet kip in the sun whilst the editor and I continued the earthworks. Once the excavations commenced we were able to continue constructing more concrete stairs leading up to the new berry and potato growing area. 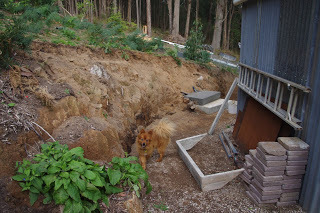 This time, Poopy the Pomeranian (who is actually a Swedish Lapphund) supervised the concrete stair construction works. 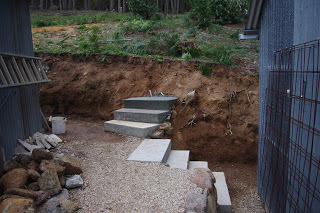 And another concrete stair was added this morning – this time with no canine supervision! On Sunday, the editor and I woke up before the sun had even risen over the farm. Only a very serious task would prompt such a horrid course of events. 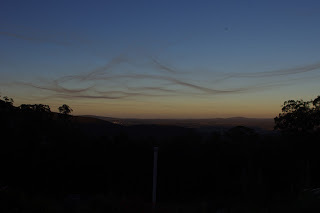 Seriously, it was a very strange and disturbing sight to see the sun rise from the east and behind the mountain range as we drove our way into the big smoke of Melbourne on an errand. That morning, two coffees were a necessity! 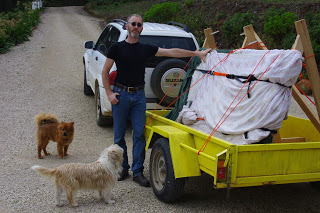 The reason that we were driving into the big smoke of Melbourne with the bright yellow trailer was that the editor had been looking for a very large and high quality second hand hardwood table on auction websites for a number of months. And during the past week, we finally scored! We won the auction on a second hand locally made tasmanian oak (a local hardwood species) timber table for $100. That was worth travelling into the big smoke to pick up on a Sunday morning because other than us, nobody was interested in that table! The table itself was over 17 years old and in the past someone had stained the timber a very unfortunate walnut colour and perhaps that was why nobody else was interested in it. However the table top was quality old growth hardwood that was dead flat and because of that I could discern that the table was lovingly made. The top was also 30mm (1.2 inches) thick timber! It was worth waking up before the sun had peered above the horizon, although I do freely admit that the coffee assisted with those problems. We brought the table back, but along the way we made the decision to stop in at the local bakery and pick up a pie and lamington each, which were very good. 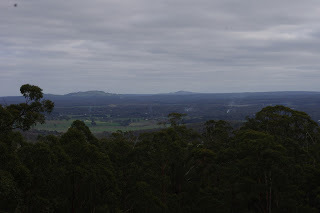 As we were on the road anyway, we thought that it would be a nice idea to stop off at a picnic stop high up in the mountain range and enjoy our pies and lamingtons whilst surrounded by the beauty of the forest up in that part of the mountain range. It was at about that time that I recalled that winter was closing in and I picked up a little hitchhiker from the picnic spot that was very hard to remove from my leg! Yes, a leech had latched onto my leg. The leech enjoyed a lovely feed until we arrived home, where a small amount of salt onto the little parasite ruined its life! 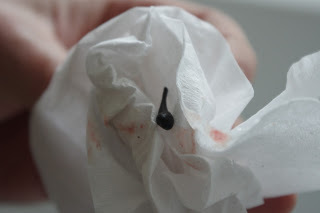 Once the leech had detached itself from my leg, the feeling of it rapidly crawling away across my skin was very creepy. 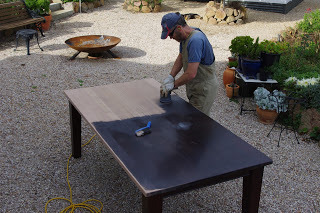 I wasn’t easily deterred by a parasite though and we soon started the task of sanding the new (to us) hardwood table. It may be hard for people to believe this, but that particular task with the hardwood table commenced over 20 years ago! 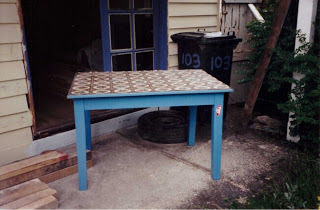 Way back then, we purchased a bright blue table with a vinyl linoleum surface for about $70. Which at the time was a total bargain. That was a very good price back then too. Nowadays as a population we are much more sophisticated because we appear to place no value at all on well-constructed and quality second hand items! Obviously, the bright blue paint and the linoleum on that table 20 years ago were forgiveable fashion sins, because underneath it all, it was still a quality antique hardwood table. So way back in the day we stripped that table back to its bare bones. And this week that same table received a structural upgrade as it was re-purposed. Unfortunately, I have completely run out of time and words and will have to continue this story of the tables next week! The temperature outside now at about 7.30pm is 7.6’C (45.7’F). So far this year there has been 282.0mm (11.1 inches) which is up from last week’s total of 262.2mm (10.3 inches). Some weekend afternoons the valley below this farm looks as if someone had decided to reproduce the land of Mordor with many smoke plumes rising into the air. Mordor, of course is Tolkien’s fictional land where the evil sorcerer Sauron lived and ruled. There was a whole lot of smoke and fire and stuff in that fictional land. With maybe a bit of brimstone chucked in for good measure, whatever that stuff is. It does sound a bit scary though! 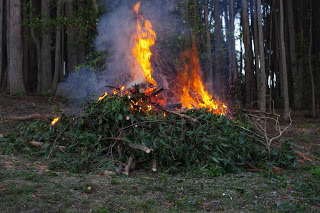 Burning off of organic material is a useful forest management technique as it can be used to selectively thin the forest. 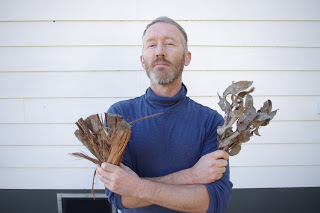 Eucalyptus trees encourage regular fires as the seeds are very hardy and long lived and often rely on fire to break their dormancy (that is the fancy name for the process where seeds know the exact time to begin the process of turning into trees). 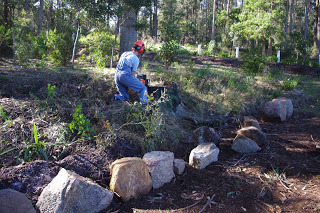 Fire also provides a lovely mineral rich ash bed (particularly phosphate which is sorely lacking in the soils here) for those new Eucalyptus trees to grow in. After really big wild fires, like the one that swept through this property in 1983 (Ash Wednesday) and resulted in the loss of much human, animal and other life, the eucalyptus forests can grow back even thicker than before. And unfortunately a very thick forest of eucalyptus trees contains very little life other than, you guessed it: Eucalyptus trees. And not much else. A much older and less disturbed eucalyptus forest contains a huge diversity of plant, animal and/or insect life. Observant readers will note that the height of the flames in my small bonfire is almost double that of the green material. Imagine what those flames would look like with a wildfire in a group of 50m+ (165ft+) trees! You can also see that the forest in the above photo is largely regrowth resulting from the Ash Wednesday (1983) wildfires that tore through the very edge of this property. The trees are very closely spaced and all have grown very tall so as to compete for light. There is also very little diversity of tree species. In fact the only different species is on the edge of that forest in the foreground of the photo just behind the fire and it is a musk daisy bush (Olearia Agrophylla). And it is also important to recall that all of the organic material in the photo above is green, it is now winter here and this stuff is readily burning. A common question that I often have to field is: What is it like living in a small community? It is a great question because having grown up in a big city, I also struggle understanding all of the subtle nuances in a small community, even after almost a decade of living here. It is often a complete mystery to me and sometimes, I very occasionally make huge mistakes, without even realising it. And in a small community those mistakes never go away. I’ve heard it said that life is often two steps forwards and one back. Long time readers may be happy to read that this week I have made peace with the guys that ripped me off last year. We had to use the language of Bloke Talk. What’s this Bloke Talk business all about? reminded of the comedy film “Airplane!” or as it was known down under as “Flying High”. The movie was very funny and it employed surrealist humour to excellent effect. One scene in particular popped into my head which was: I Speak Jive! Unfortunately, I don’t actually speak Jive language and really had no idea what the actors in the film were actually saying, but the humour and the absurdity of the interaction was not lost on me. However, I do actually speak “Bloke Talk”. Bloke Talk is the un-recognised language spoken by a lot of males down under. My father left when I was a very young child, so unfortunately I grew up being the only male in an otherwise very female household and so I have had to learn Bloke Talk by trial and error. Bloke Talk spoken words: “G’day mate. I wanna book a car in for a service”. Observant readers will note that this was spoken as a statement and not posed as a question. The transaction was then conducted in Bloke Talk. Once completed, I then said: “Thanks mate”. English translation > Thank you very much for your time. After my mother and I walked out of the mechanics, she looked at me and asked: “Where did you learn how to speak like that?” To which I replied in my best Bloke Talk: “I dunno!”. And that was that. Anyway, Bloke Talk is a useful skill to utilise and I did that with the guys that ripped me off. We have now all arrived at a mutual understanding of each other perspectives and we can all move forward so that everyone benefits. This Bloke Talk business is tough as, but it does seem to work – sometimes. In other farm news, we continued to excavate this week. The excavations are all done by hand and we cannot commence the new berry and potato bed project on the terrace above those excavations until these are complete. The initial stage of excavations begins with loosening all of the clay in the cutting with an electric (solar powered of course) jack hammer. An antique rake (Sheffield Steel no less) and mattock was then used to drag all of the now loose clay off the embankment and onto the ground below it. 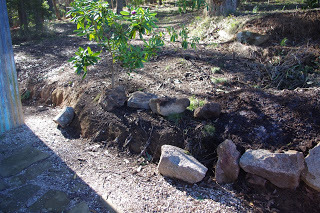 The soil was then loaded into a wheelbarrow where it was removed to another location where that soil was used as fill for a ramp leading downwards and into the orchard. 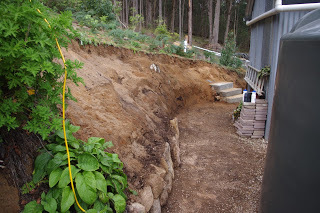 Eventually all of the loose soil was then removed. 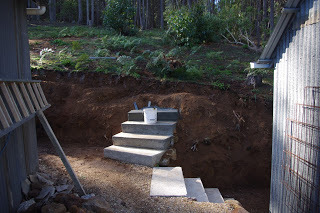 Another concrete step was added to the existing staircase which will eventually provide access to the new berry and potato bed project. I really like earthworms because they displace the ants. I’m not overly fond of the ants here, although they do some solid work in the soil, however the little blighters annoy me by biting me whilst injecting formic acid and then also just in case I hadn’t quite learned my lesson not to annoy the ants, they then spray the skin surface with the same acid. All that leaves chemical burns on your skin which are not pleasant! Needless to say, the ants are not my friends! The earlier warm May has disappeared this week and it has been very cool to cold. This morning there was even a light frost here. A light frost here means a very heavy frost in the valley below. People often tell me how cold it is in the mountains and I usually agree with them to be polite. The truth is that all that cold air from here falls downhill and it is far colder in the valley below where all of that cold air accumulates. The frost tends to wash out the colours too so that even the grass, which is otherwise very green at this time of year, looks as though it has had a black and white filter applied to the scene. It was so cold this morning that I was a bit concerned for Tufty Head the second in charge of the chicken collective here at the farm. Tufty Head is going through a very late autumn feather moult and so is probably a bit cold. 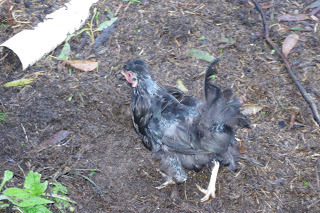 She is an unusual chicken of dubious and uncertain parentage who is most likely a Silkie / Australorp cross, but I don’t really know. She is an excellent egg layer, once she has regrown her winter plumage anyway. Observant readers will be able to spot the white spears in her plumage which are actually what new feathers look like when they regrow. 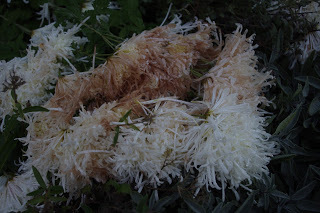 Not every plant can survive a light frost and the Chrysanthemum flowers died back a bit this morning. 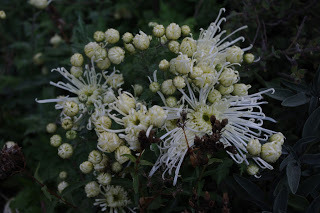 You can even spot ice crystals on the flowers. Other plants simply shrug off a light frost. 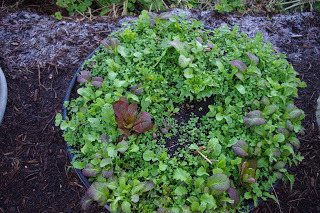 The next photo shows a bed of: Green lettuce; Red lettuce; Green Mustard; Red Mustard; Chickweed; Rocket; and Oak Leaved lettuce. All of these plants are grown closely together and in turn they keep each other warm. 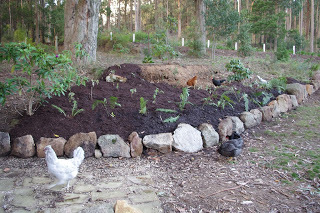 It is also interesting to note that the composted woody mulch behind the raised garden bed actually attracts frost which is not present in the raised garden bed. The new second hand large hardwood (tasmanian oak) dining table has continued to be sanded this week. And better yet, the job of sanding the previous questionable walnut acrylic finish, is almost but not quite complete. The tight grain of the hardwood timber is really starting to look good. We interrupt regular programming to bring breaking wombat news: Baby wombat is now looking suspiciously pregnant and carrying around a very large lump in her pouch. The temperature outside now at about 9.30pm is 1.9’C (35.4’F). So far this year there has been 297.6mm (11.7 inches) which is up from last week’s total of 282.0mm (11.1 inches).